As I prepared for our next coaching sessions, I paid particular attention to finding the meaning of the word 'Success' & I was reminded of all that term really encapsulates. Many Mumpreneurs I work with on a 1:1 basis within my business coaching practice say they want to be 'successful', without really understanding the cycle that 'success' runs through. Without never really understanding the hard work, negative characters, confidence blowers, gatekeepers, tears & attempts that go into a woman's business idea, brand, product or business model becoming 'successful'. Many just assume that success will come overnight, or after a few months of hard graft.... then when it doesn't instead of re-evaluating pinch points. They just give up... often as they are on the brink of their breakthrough! When I look at my personal accidental entrepreneurial journey & that of the clients I work with & Mumpreneurs that I meet out & about in #MumpreneurLand who have in some people eyes reached a level of success. They have two main characteristic in common... They didn't chase success & they did not give up! In return their mission to fulfill what they strongly believed they could achieve within the business world brought not only success but happiness & fulfillment. 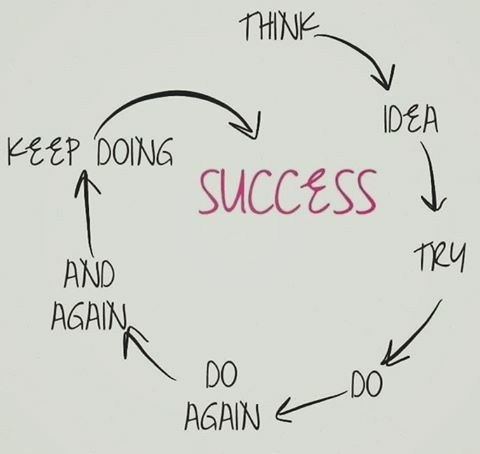 I have often used this pic in my Blog posts & thought it was a great example to use again, because it explains success in its simplest form. So for those of you who may have been on the brink of giving up in #MumpreneurLand, keep going huni! & for those of you who have read this till this point... kudos to you babe why? Because again you didn't give up! Be inspired my lovelies, entrepreneurial success is not for everyone especially the chasers. But usually find the ones who keep going & don't give up... no mater how often people try to dull their inner sparkle.